A 27-year-old man is suing rapper Jay-Z's trendy Atlantic City club after cell phone video captured bouncers beating him up outside the building last month. The video, shot by another patron, went viral on You Tube – and the bouncers caught on tape administering the beat down have since been fired. Bryant Norwood had gone to the club on Nov. 27 along with two of his friends – Tyrell Durant and Leonard Clark. The three were ejected from the club by several security staffers who assaulted Norwood and Durant once they got outside, the footage shows. The video, taken by club patron DJ Zeke, begins with bouncers kicking a man on the ground in a back lot. One of the club’s staff members then turns to punch a man who was standing to the side of the crowd and suddenly the whole crew of men in black clothes, some having the words “security” and “event staff” written on the back of their shirts, swarmed the second man, punching, restraining and choking him. Norwood is currently seeking medical treatment for his injuries, his lawyer, Thomas Mallon, said in a statement. "Mr. Norwood paid $40 at the door to get into the 40/40 Club 40/40 to have a good time with his friends, but he ended up being kicked out and beaten by club employees," Mallon said. "DJ Zeke’s footage clearly shows that Mr. Norwood was the victim of a vicious beating for no reason. 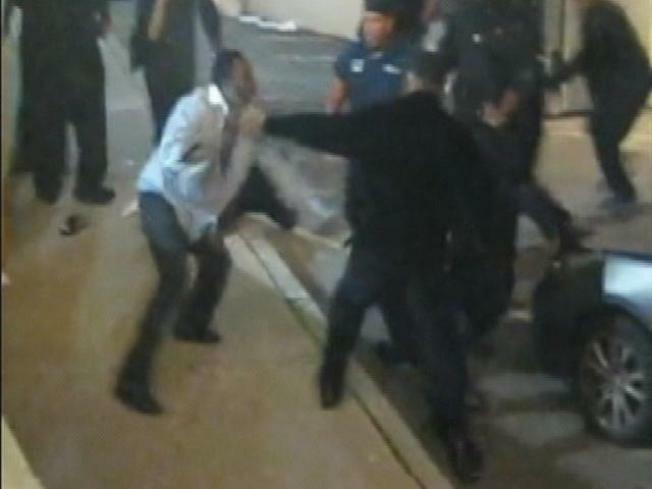 Filing this lawsuit means that these so-called security personnel are going to have to answer why Mr. Norwood was lying on the ground being kicked and why he was punched in the head as he tried to escape from them." "The 40/40 Club is going to have to answer why they hired people like this to supposedly protect their patrons and maintain order in their establishment," he added. Atlantic City police have said the security guards may face charges in connection with the incident. The two other men assaulted in the fight are also expected to file lawsuits.